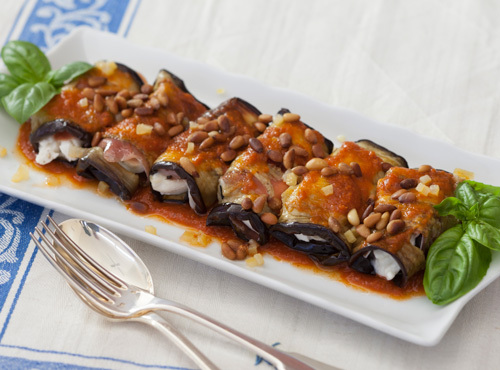 These sicilian-style eggplant rolls are excellent as a light lunch with bread and a green salad and would also be welcome as part of a buffet table. Sometimes I add a little finely chopped preserved lemon to the tomato sauce. Cut each eggplant lengthwise to give 4 shapely 5 mm thick slices (reserve curved side sections for another dish). Arrange slices on a tray and sprinkle with salt. Cover with a clean tea towel and weight for 1 hour with a heavy olive oil can on its side, or something similar. Meanwhile, make the sweet-and-sour sauce. Simmer tomato sauce with sugar, vinegar and pepper in a wide saucepan until reduced a little. Taste – the sauce should have a definite sweet–sour character, but may need a squeeze of lemon juice. Set sauce aside. Preheat oven to 220°C. Trim prosciutto by removing rim of fat on each slice, then cut each slice in half crosswise. Cut each mozzarella into 3 x 1 cm thick slices and halve slices crosswise to make 12 half-moons of cheese. Grind a little pepper over the cheese. Rinse eggplant and dry very well with kitchen paper. Film a baking tray with oil and arrange eggplant slices on it. Do not overlap. Brush exposed sides with more oil and bake for 15 minutes or until underside of slices is golden. Turn and cook other side for 10 minutes until eggplant is tender. Remove from oven and transfer to a tray or plate to cool. Spread two-thirds of sweet-and-sour sauce on a serving platter. Take 1 eggplant slice and top less-coloured side with a slice of prosciutto and a piece of mozzarella. Roll up, starting from the narrowest end, and put seam-side down on platter. Repeat with remaining eggplant, prosciutto and cheese until all rolls are snugly in place. Spoon over remaining sauce and scatter with basil. If desired, scatter around pine nuts and preserved lemon.